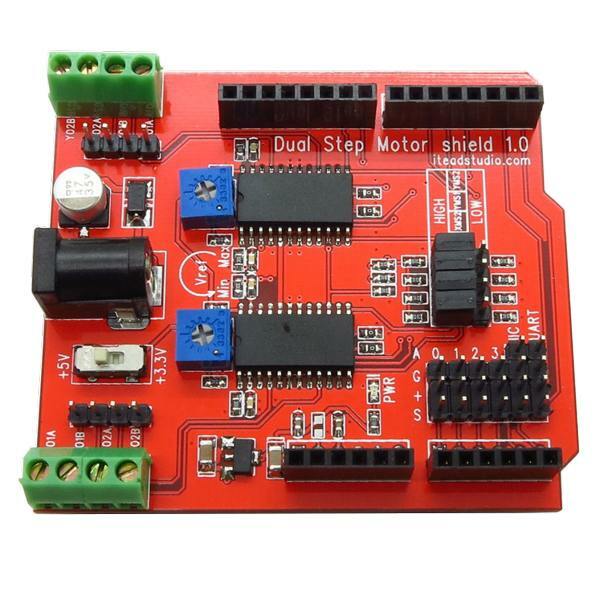 The ITEAD Dual Stepper Motor Driver Shield enables your Arduino or compatible microcontroller to drive two stepper motors. This Arduino shield is specifically designed to drive two independent 4 pin bipolar stepper motors. It supports stepper motors with operating voltages from 4.75V to 30V at up to 750mA and can be used with 3.3V or 5V Arduino compatible microcontrollers. Dual A3967 microstepping motor driver chips are used to drive the stepper motors. The A3967 driver chip features automatic current- decay mode detection and selection, crossover-current protection and has built in thermal shutdown circuitry. It is designed to drive bipolar stepper motors in full, half, quarter and eighth step modes using a minimal number of control lines. This is the same chip used in the popular EasyDriver boards. 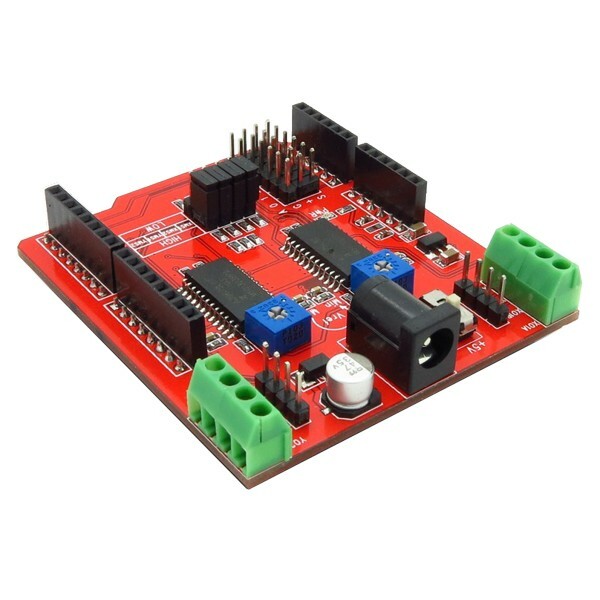 This shield is like having two EasyDriver boards mounted on an Arduino friendly shield. This shield also has a set of 3 pin analog input and 4 pin i2c and serial port header pins for additional convenience. Use this Arduino shield to drive your robot or create a robotic CNC machine or a two dimensional art generator.